Wingate Jones in front of his New Orleans business. With a temperate climate and generous tax incentives, Louisiana has been luring the California-based film industry south, creating thousands of new jobs and businesses in the process. "We have been on a steady upward trajectory since Louisiana adopted its incentive program in 2002," said Chris Stelly, executive director of Louisiana Entertainment, a government organization tasked with developing the state's entertainment industry. "2013 was our biggest year." With films like G.I Joe, The Butler and Enders Game shot in the Bayou State, last year it topped Film L.A.'s Feature Film Production Study as the number 1 location for motion picture filming. From 2002 to 2012 (the last year data was available), the industry created more than 14,000 jobs -- more than half of which were between 2010 and 2012, according to the Louisiana Department of Economic Development. It's reflected in a variety of jobs -- everything from costume shops to caterers to truck drivers. Stelly estimates small businesses represent over 50% of the state's $1 billion film industry. "There's plenty of opportunities for business of all sorts and sizes -- small businesses in particular," he said. New Orleans-based Hollywood Trucks is one business that has expanded with the state's growing movie production. Andre Champagne, a 37-year-old native of Baton Rouge, La., started Hollywood Trucks in 2007 when the state was still in the infancy of its film incentive program. He had $100,000, one employee, five vans and two stake-bed trucks. "At the time, the state had a fantastic program, but because it was in the starting stages there was no infrastructure," Champagne said. Today, Champagne has a fleet of over 300 specialized trucks that provide everything needed for on-location filming -- from restroom trailers to flatbeds for moving props. He has 14 full-time employees and brings in $5 million a year. The young entrepreneur said he really started to notice the industry's growth in 2009, which Stelly confirmed. "The film industry was pulling itself out of the recession, and [Louisiana] started to see a pick-up in late 2009 and 2010," Stelly said. Wingate Jones was poised to take advantage of this recovery. "I opened up Southern Costume Company to fill the niche that I saw," said Jones, who had worked in the wardrobe department of films in California and saw that Louisiana didn't have a costume shop catering to the film industry. "I bought a bunch of stuff in California and a trunk load [of garments] from different studios to bring into New Orleans," said Wingate, who invested around $60,000 to start the business. He offers on-site tailoring, production rentals as well as costume rentals for the general public, especially during Mardi Gras. Jones said the movie portion represents over a third of the shop's business. "The motion picture and television industry has helped me keep afloat," he said, estimating that he's rented to about 90% of the productions in New Orleans and 30% of those in Louisiana. The industry shows no sign of stopping its love affair with Louisiana. 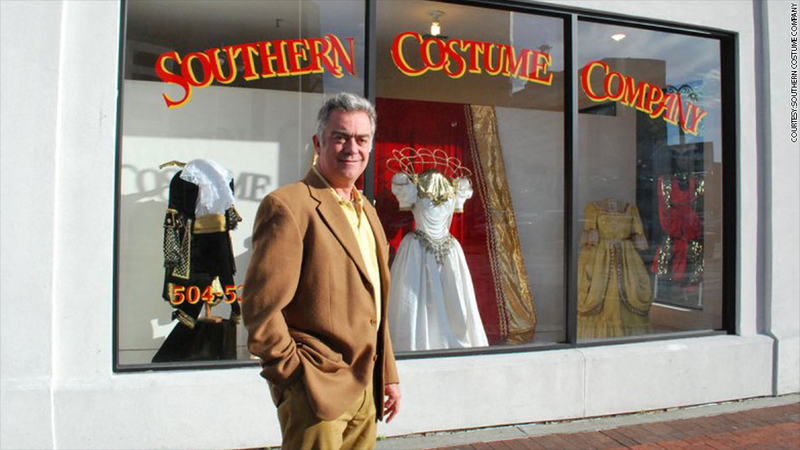 The Southern Costume Company outfitted Dallas Buyer's Club, 12 Years a Slave, and is currently working on the latest installments of Terminator and Fantastic Four. "I think we will meet or exceed those number that we had last year," Stelly said. "It's just kind of one of those states that kind of allows the artistic spirit to thrive."